Addition word problems in this packet are correlated to common core standard MCCKOA 2. There are 36 pages. 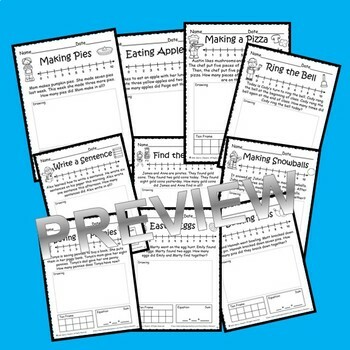 Each of the 36 pages includes one addition word problem to solve. Each page has a number line for students to use to solve the problem. An empty box is available for students to draw the matching picture for the word problem. 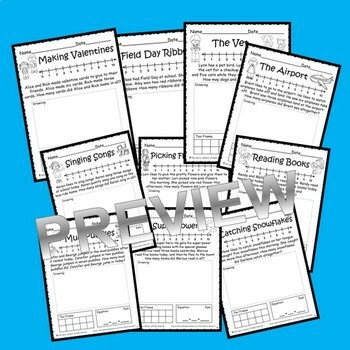 There is also a ten frame box for students to use for counters or for drawing or coloring in the boxes and an equation box containing blanks, a plus sign, and an equals sign. 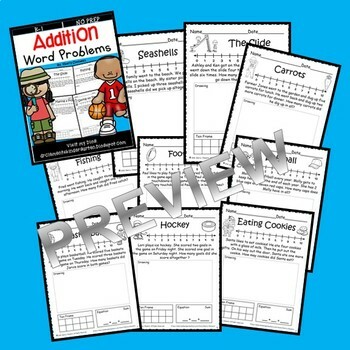 The word problem titles for the 36 addition word problems are (Seashells, The Slide, Carrots, Fishing, Football, Softball, Basketball, Hockey, Eating Cookies, Making Pies, Eating Apples, Making a Pizza, Ring the Bell, Write a Sentence, Find the Gold, Making Snowballs, Saving my Pennies, Easter Eggs, Bowling Pins, Making Valentines, Field Day Ribbons, The Vet, The Airport, Singing Songs, Picking Flowers, Reading Books, Mud Puddles, Super Power, Catching Snowflakes, Eating Fruit, Catching Bugs, Hotdogs, Animal Tracks, Birthday, Hugs, Hugs, Hugs, and Cars and Trucks). 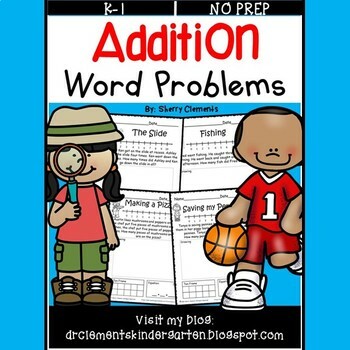 Many addition and subtraction word problem packets are available as well as addition and subtraction problems (sums to 10) with manipulatives. Also, be sure to leave feedback on all of your previous purchases to receive credit toward future purchases. Simply go to your MY PURCHASES page and click on the green "Provide Feedback" links! Quick and Easy!